Adult apterae of Impatientinum asiaticum have an extensive shiny black dorsal shield (see first picture below). The un-sclerotized lateral and ventral parts of the abdomen are green, pink or red. The fused apical segments of the rostrum (RIV+V) are 0.84-1.0 times the length of the of the second hind tarsal segment. The apices of the tibiae are dark or black, and the distal parts of the femora are black (cf. Impatientinum balsamines which has the apices of the tibiae pale, and the distal parts of the femora pale or dusky). 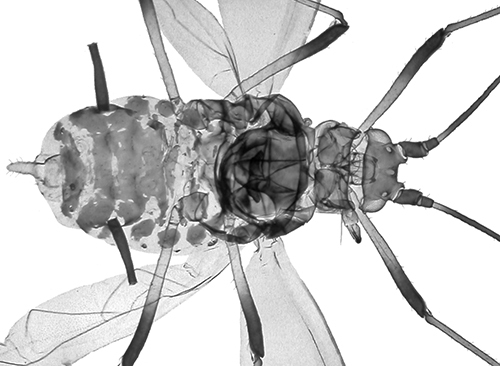 The siphunculi are black and are 0.63-0.81 times the length of the third antennal segment (cf. Impatientinum balsamines which has the siphunculi 0.57-0.66 times longer than the length of the third antennal segment). Both images above copyright Marco de Haas, all rights reserved. The alate Impatientinum asiaticum (see second picture above) is green or pink with a more fragmented dorsal shield than the aptera. Impatientinum asiaticum is thought to have originated in central Asia. The north Indian subspecies host alternates from Smilax to Impatiens, but outside of Asia the species has lost its primary host. In Europe it lives all year round on the invasive Himalayan balsam (Impatiens glandulifera) and especially small balsam (Impatiens parviflora). It feeds on the undersides of leaves along the main veins, and on the flower stalks. It is not attended by ants, and produces sexual forms on the secondary host. Impatientinum asiaticum is found in south-east England, most of Europe and parts of Asia. The host plants of the Asian balsam aphid are Himalayan balsam (Impatiens glandulifera) (see first picture below) and small balsam (Impatiens parviflora) (see second picture below). We have often searched plants of Himalayan balsam for this aphid in southeast England (mainly in East Sussex), but have yet to find it. As far as we know Impatientinum asiaticum has only so far been recorded in England from Middlesex and Surrey. Second image above courtesy of Moelkuel, under the Creative Commons Attribution 3.0 Unported license. In Europe Impatientinum asiaticum is more widespread, and Marco de Haas found it commonly on small balsam in the Netherlands. 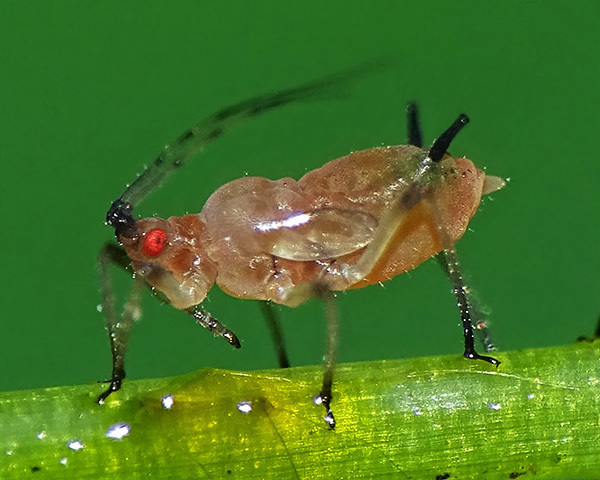 The pictures of the live aphid on this page come from Marco. 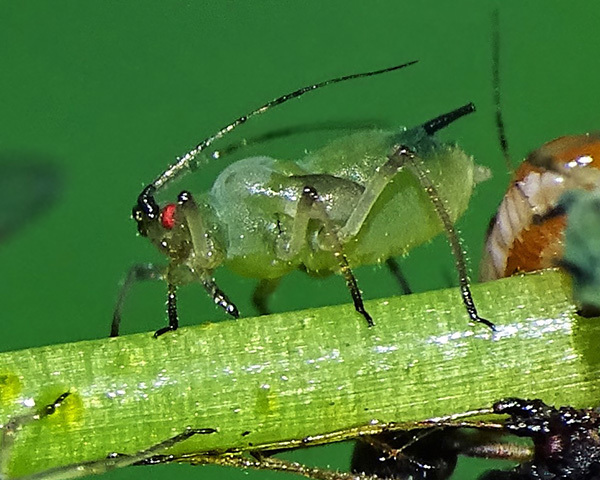 The aphid has several colour forms and may be green, pink or red - the pictures below show fourth instar immature alates of the green and pink forms. Images above copyright Marco de Haas, all rights reserved. 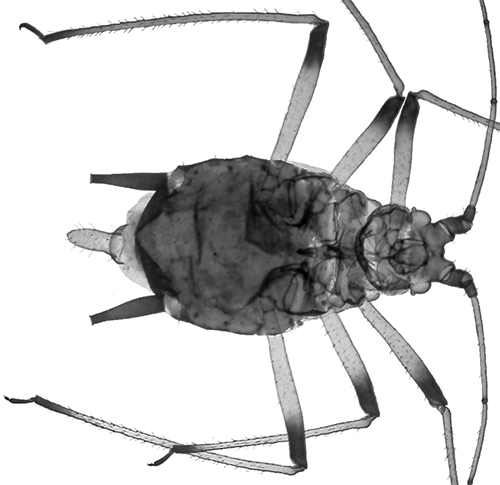 Despite having lost its primary host, the Asian balsam aphid has retained its sexual forms, and winged males and oviparae may be found in autumn on balsam in Europe. Blackman & Eastop list 9 species of aphid as feeding on Himalayan balsam (Impatiens glandulifera) worldwide, and provide formal identification keys. 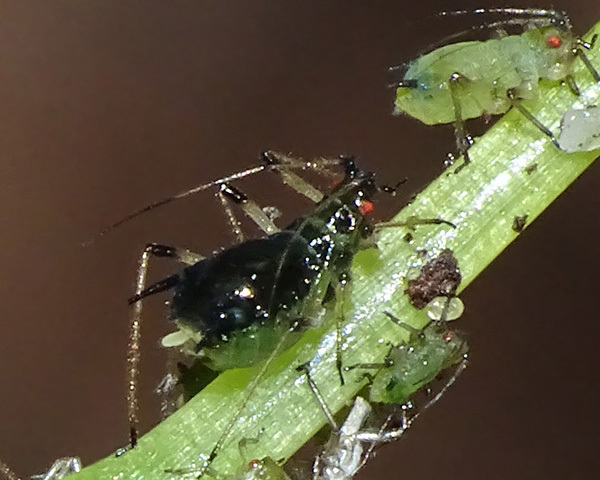 Of those aphid species, Baker (2015) lists 5 as occurring in Britain: Aphis fabae, Aphis nasturtii, Impatientinum asiaticum, Impatientinum balsamines, Myzus ornatus. Blackman & Eastop list 4 species of aphid as feeding on small balsam (Impatiens parviflora) worldwide, and provide formal identification keys. Of those aphid species, Baker (2015) lists all 4 as occurring in Britain: Aphis fabae, Aphis gossypii, Aphis nasturtii, Impatientinum asiaticum. Himalayan balsam is a major invasive pest in many parts of the world including Europe and North America. It frequently out-competes local plants, especially on river banks. There it promotes river bank erosion due to the plants dying back over winter, leaving the bank unprotected from flooding (Greenwood et al., 2014). 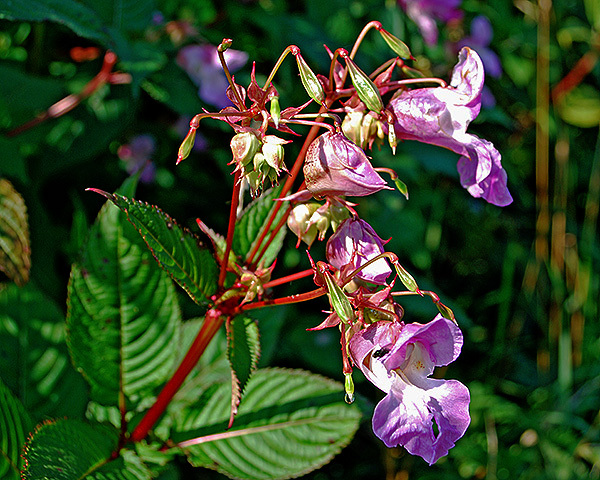 Various methods have been used to control Himalayan balsam including manual destruction of the plants and release of a rust fungus. 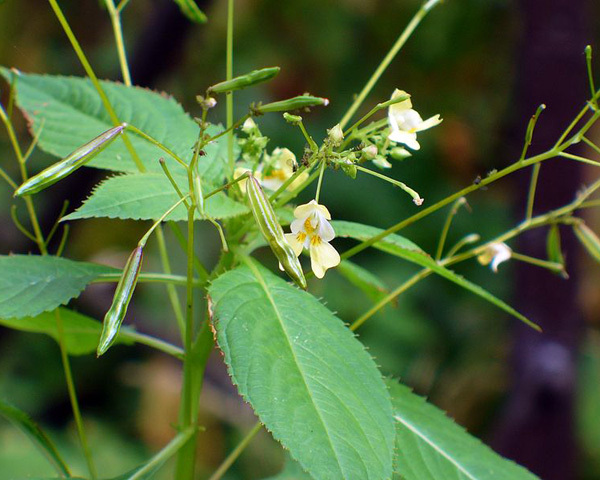 Small balsam is also considered a dangerous alien plant, especially in Slovakia where it is invading forest stands. Eliasova (2011) evaluated the aphid Impatientinum asiaticum as a potential biocontrol agent of small balsam. 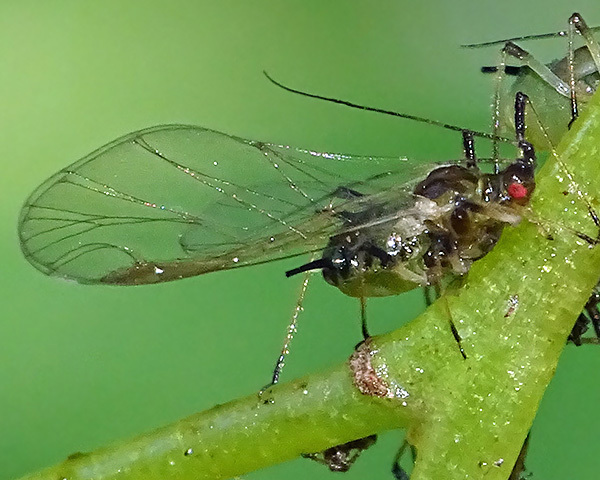 It was concluded that, in certain circumstances, the aphid could play a role in suppressing Impatiens parviflora populations alongside other agents such as rust fungus. We are very grateful to Marco de Haas for his images of Impatientinum asiaticum, especially so since he obtained some of them (those of the adult aptera) at our request.